All the Mitzvah Day projects seem to be well-intended and worthwhile (at least the ones I’ve seen). However, I want to suggest that the vision of Mitzvah Day is too narrow. There are some commandments which are not included in any Mitzvah Day or Big Sunday I’ve seen. These are the commandments to protest against injustice, and to treat workers fairly. Therefore, I would like to think that this Thursday, (November 13) in front of the Walmart in Pico-Rivera, will be Mitzvah Day 2.0. 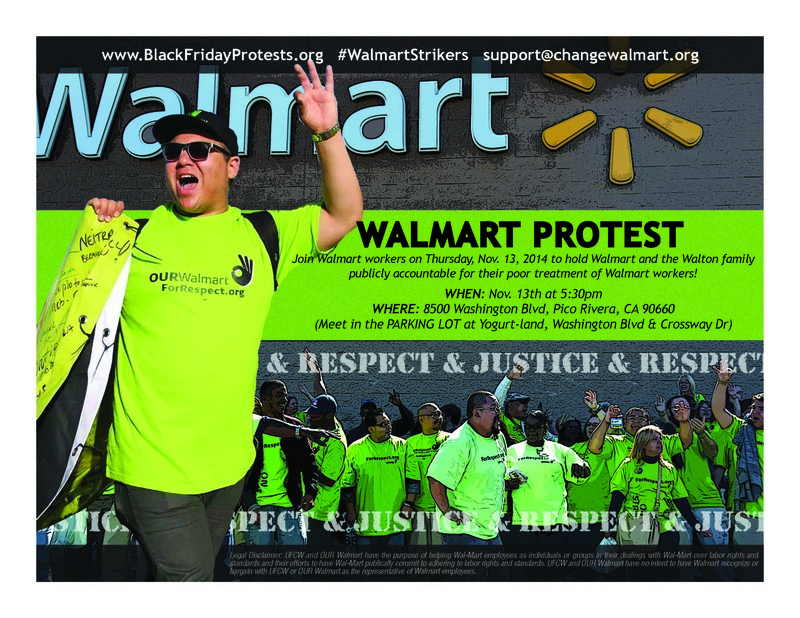 Workers, clergy, and community members will be protesting against Walmart’s mistreatment of its workers and demand that Walmart pay its employees at least $15 an hour, and that they have access to full time employment. One of the foundations of a just society is that relationships between workers and employers be based in mutual respect. This means, at the very least, that the employers recognize that a worker is different from a cash register or the stock on the shelves. The worker is a person, not merely an expense line on the budget. The implication of this, is that part of the obligation of an employer is to pay a salary on which a worker can live. That type of living wage (which is about $15 an hour with full time employment) would allow a worker to afford food and shelter, education and healthcare. (It would of course be higher if we were to take into account the ability to raise children.) It is the obligation of a just society to ensure that this happens. When it does not, society must be held responsible. Walmart has been a consistently bad corporate citizen. Many Walmart workers cannot afford to support themselves and must rely on public assistance to get by (about $6.2 billion). The rest of the community then is allowing Walmart to pay poverty wages by subsidizing those wages with our tax dollars. Walmart actively fights against union organizing among its workers. When a store successfully unionized (in Canada), Walmart closed the store. So this week on Thursday we inaugurate Mitzvah Day 2.0. We (clergy of all faiths and community members) will take to the streets in front of Walmart (8500 Washington Blvd, Pico Rivera, CA 90660) and stand together with workers to demand respect and dignity—to fulfill our obligation to protest against the injustices that Walmart is carrying out against its workers, lest we too be held responsible. Join us. Together we create a more perfect and just union. Walmart claims that it had a bad 4th quarter this year but it still will have made $15B in profits. Also great: go to www.BlackFridayProtests.org and find out how to join one of the Black Friday protests at a Walmart near you. This entry was posted in Black Friday, community of obligation, economic justice, health care, Jewish left, labor, Mitzvah Day, Talmud, Uncategorized, Walmart by admin. Bookmark the permalink.